Constitution’s Numbers Mixed in Jockey Club Gold Cup: BRIS Speed Ratings and Beyer Speed Figures paint different pictures for Constitution, a contender in Saturday’s Jockey Club Gold Cup (GI) at Belmont Park. On BRIS, his winning figure for the Donn H. (GI) earlier in the year is 102, a number surpassed by every horse in the race. Using the Beyer Speed Figure scale, his Donn number is 111, the highest in the field this year. When the major past performance companies do not agree on a horse’s speed, the number is less trustworthy. Expected favorite Tonalist sits close behind on the Beyer Speed Figure scale. He earned a 110 Beyer Speed Figure for his third in the Whitney (GI) at Saratoga Race Course, but “crushed” Constitution’s 102 BRIS number from the Donn with a 108 on BRIS. Is Tonalist faster than Constitution then? How many seconds faster? Someone get out a calculator. If anyone wonders why Constitution’s recent turf flop and the subsequent low speed figure on both scales does not factor into the discussion, well, the attempt came on turf. Why would anyone care about a horse’s failure on turf, in his first lifetime try, if the current race is on dirt? Forget the numbers. Constitution always showed signs of talent. He defeated the popular Juba in his debut win at Gulfstream Park, and went on to finish three lengths of ahead of Tonalist in a Gulfstream optional claiming event. The son of Tapit captured a Grade I race in his next start, defeating decent stakes horse Wildcat Red in the process. The losses to Easter Gift and Hoppertunity in Constitution’s races last fall were disappointing, but the first one is explained by the long layoff. Losing to Hoppertunity in the Clark only looks disappointing now because he proved to be the ultimate hanger. At the time, Hoppertunity appeared more promising. In the Donn, Constitution returned to form at Gulfstream Park, the site of all his wins. Off only two non-Gulfstream Park starts on dirt, not enough evidence exists yet to believe he cannot transfer his Florida form to other racetracks. The reunion with Javier Castellano will help. Of course, anyone can see Tonalist loves Belmont Park, probably as much as Constitution shows affinity for Gulfstream. 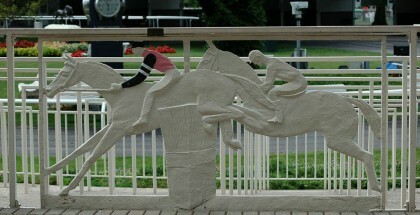 With four wins out of six attempts at Belmont, and two seconds, he never turns in a poor effort at this racetrack. Also, he is a proven graded stakes winner firing bullets coming into this race. A sloppy dirt surface will not bother him, as he won the Peter Pan (GII) last year in the mud. No one can be faulted too much for using Tonalist on their tickets. Just be aware of the lack of value. Three out of the other four horses can win as well: Wicked Strong, Coach Inge and Effinex. Wicked Strong initially became popular for his name, in addition to his powerful victory in the Wood Memorial (GI) last year. This year, the colt lacks a win. On the positive side, he tends to hit the board. 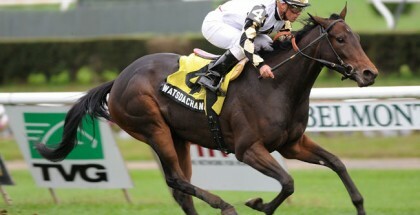 Coach Inge did not receive a favorable ride in the Woodward against Liam’s Map. In fact, it could be argued the connections only ran for second place because Coach Inge enjoys contesting the lead and never tried to apply pressure. If the jockey sends him early in this spot, Constitution will hound him. Effinex never had a shot in the Woodward because every other jockey became too scared to challenge Liam’s Map. This left Effinex with an unfavorable pace scenario. Except for the one race where he bolted, Effinex’s record looks sharp this year. He should come late. Will he come too late? It depends on whether Coach Inge and Constitution duel early or not. Despite only six horses, the Jockey Club Gold Cup is wide open this year. Any of the aforementioned five horses can win, which means siding with a horse with value seems like the best strategy. Whether or not Tonalist wins, fans love the horse a bit too much. Give Constitution or the others a chance. Watsdachances of Chad Brown Winning Flower Bowl?